Is a multimedia Artist working across sculpture & video to create a singular universe. Her work explores humans riddled with contradictions and the pull between our physical realities and the surreal mind. She often uses grandiose accessories and ludique decor to exaggerate this tension. DS: Hi Shayna! We are so excited to premiere your film and get to know you better as an artist! How would you explain your work in your own words? SK: Hi Daisy, thanks for inviting me to do the interview! I am always striving to create a singular universe in which I can play out my fears, insecurities, and fantasies. 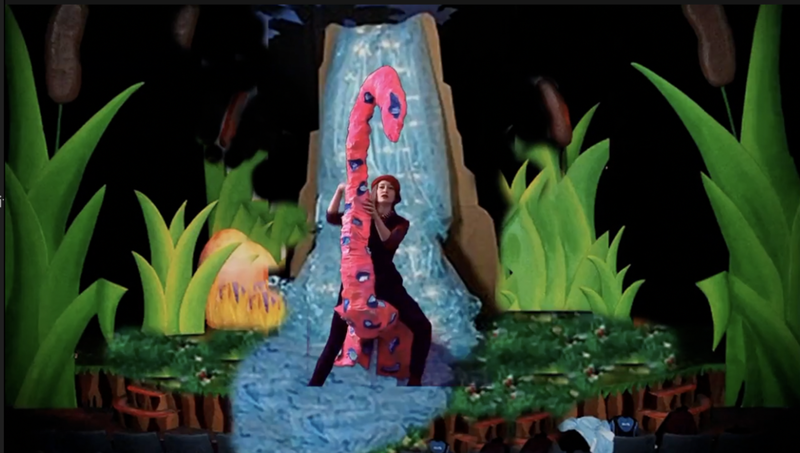 This takes many different forms throughout my sculptural practice, but in my videos, this desire tends to manifest as colorful pop-up worlds that serve as both the ‘decor’ and the catalyst for the story. I’ve always been fascinated by the temporality of theater, the sets that are built, stories that exist for only a few weeks and then become dust—and really try to capture that same essence of fragility and magic in my DIY approach to filmmaking. This tends to give a naive and ludique look that helps bring joy and funny situations into the process. I like the idea of using humor and empathy to explore the human condition and the contradictions and pull between our physical realities and the surreal mind. DS: Your work has a very singular aesthetic - you are not afraid to incorporate fun and joy in your work, which is becoming increasingly rare and I think is very brave. What films and filmmakers inspire you? SK: Thanks so much, that playfulness is something I really enjoy and cherish about the creative process. My favorite feature filmmaker of all time is Woody Allen for his older films like Interiors, The Purple Rose of Cairo or Manhattan. I love how much humor, poetry, and imagination he incorporates in his films. His well rounded and imperfect characters are something I also really admire. Other huge influences for me have been Shelley Duvall’s Faerie Tale Theatre for television, Alex Bag, Ryan Trecartin, Kenneth Anger, Pipilotti Rist, Michel Gondry, Miranda July, and Shana Moulton. DS: You are also a Youtube star! Can you speak a little about your journey of creating content for Youtube and the effect if any that Youtube has had on your artistic process? SK: Sure! Youtube was/is appealing to me because its immediacy really excites me. It is something that started out as an activity I did for fun as an outlet to document my journey and perspective as an American living in France. I then realized what a beautiful place it could be to interact and build a community around my life as a creative as well. My actual films take a long time to edit and prepare, so having the criteria of youtube videos where to grow a community you have to have consistent weekly uploads presents a unique set of challenges that keep things interesting. DS: You have taken an interesting approach to your craft - ostensibly rejecting the traditional path for film and video in favor of releasing your work on Youtube and in galleries. To me, these spheres could not be more different - Youtube is so public and the art world is notoriously private and exclusive. Can you elaborate on your experience within these worlds? SK: I think that for a long time, artists relied on galleries or producteurs to be the gatekeepers to success. There was and still is a very mysterious bubble around these institutions, but thankfully now more than ever, we can create our own opportunities and platforms. I feel There is definitely some snobbism within the art world in regards to artists who use social media like Instagram or even youtube as a tool to gain recognition, but I am not above utilizing social media as a platform to show my work. I never cared about being considered a serious artist. If youtube is considered low-brow because it pops the mystery bubble, I love that. I choose to share my process online because I think art should reach as many people as possible! To me, the idea of connecting with thousands of people online in a different part of the world is vastly more exciting than a couple hundred in a dark room in a gallery. I think the future will be about taking things into your own hands. DS: Do you have any plans to make a feature film at some point? What is the overarching goal for you as an artist? SK: Yes, I would love to! I am working on a short film now that I consider a prototype for a feature, but I am also not in any hurry to fit that mold. My overarching goal is to sustain a high level of excitement and wonder while creating things that resonate with myself and with my generation. Whether that’s in galleries or online, doesn’t matter. I hope to never stop challenging myself. DS: Personal style seems very central to you! Do you have any sartorial film icons? SK: I don’t necessarily dress like them, but I do love a good bold style. Some faves are Fairuza Balk’s character from The Craft, Sharon Stone in Casino, Anna Karina in Une Femme est Une Femme and of course Annie Hall in Annie Hall. DS: What has living in Paris done for you as an artist and a person? Do you have any favorite films set in Paris? SK: It’s taught me not to be afraid to take risks, try new things, or fail. You do a lot of failing when adapting to a new culture, and keeping that sense of humor has definitely helped when trying to make it as a creative. I’ve also gotten to experience art school here which is a whole other world, been faced with challenges in self-expression which is, of course, all material for art. I feel like life is better for a creative person in Europe, or at least in France. In my experience, writers, filmmakers, artists—are all valued because culture is placed on such a high pedestal. DS: What was the inspiration for Deprimé avec les simpsons? SK: A lot of my films deal with dark subjects hidden behind a candy-colored façade, which was the case for Deprimé avec les simpsons. I had witnessed a young man falling off the roof of a five-story building really early before work one day. He had just been drinking beers with his girlfriend at 5 AM and watching the sunrise when he slipped and died under our bedroom window. His girlfriend was screaming for hours on end and there was just nothing we could do. My partner and I were horrified and then an hour later I had to go to work. When I came back everything was cleaned up, of course, because in a big city, things happen and life goes on and it doesn’t even make the news. It didn’t even seem real. It obviously made me think a lot about my own mortality, and at the time we were watching a lot of The Simpsons for some reason. I thought about how long the show has been around, and how none of the characters age or change. How we use TV or screens to numb ourselves. I imagined it being a sort of limbo, where maybe we would go when we die and are in denial about it. So the film was born from that to kind of deal with this anxiety and fragility I felt. My character ends up leaving her life as a Simpson to come to terms with her own death. DS: Can you walk me through the process of creating one of your videos? SK: I will start with an idea or an object that I want to explore and build from there. For example, one of my films was based on a horse sculpture I made which reminded me of an imaginary friend I had when I was little. I created a song from that, and then built the decor and filmed the actors on a green screen. I tend to use green screens because then in the edit I can test out many different situations. I do end up doing a lot of the meaty parts of the film in the editing process. I enjoy the collage DIY aesthetic so I mix a lot of real props with computer effects to bring out that character. I end up leaving in little imperfections as I rejoice in the immediacy of needing to create something with the techniques and what I have on hand. I think that has always been important to me, to do with what you have now. DS: In one of your Youtube videos, you take yourself on “an artist date”! How would you explain this practice and how would you encourage people to begin this practice? SK: The Artist’s date is a practice that is inspired and come from a book entitled “The Artist’s Way” by Julia Cameron. It’s kind of a cult self-help book for Artists where you get in touch with your inner ‘Artist child’. The book was created to help blocked artists give themselves permission to loosen up a bit and one of the activities she proposes is “Artists dates” where you take yourself out to do something just for fun, to get inspired. Some ideas for those could be super simple and silly like going to the dollar store and getting stickers and ribbons and glitter and making some crazy craft, or going to the Theater, or getting yourself a roll of film and taking pictures around the city. The idea is there is no pressure on it, just play time/quality time to have fun making something. I do these once a week because when you are an ‘artist’ we are so quick to judge ourselves and to make every little thing a masterpiece. In reality, the joy and real sweet spot are in the moments of play!